Hi, my name is Holly and I have crazy sensitive skin. I can only wear certain types of make-up and I can barely wash my face with anything. It's a mess for a thirty one year old woman with mad amounts of acne. I just want to cover it all up, but I can't. Trust me it's über cool looking. Eric has even more sensitive skin than I do. Years before Caleigh was even born we figured out that he was reacting to perfumes in our Tide laundry detergent. We switched to All Free and Clear at that point and things seemed fine. He would have frequent flare-ups, but we would blame them on the environment at large. He even had some trusty steroid foam to calm things down. Flash forward to our ever so sweet daughter and you've got some of the most sensitive skin around. Caleigh is definitely a combo of her parents. Her allergic reactions and sensitivities are on her medical file, and weekly I have to list them at whatever appointment we might be at. Tape Adhesive is listed as one of her allergies. Caleigh gets huge whelps at contact with the adhesive used in medical tapes. Even band-aids tear her skin up. When Caleigh was smaller her skin would break down eventually, but not right away. At this point it takes even a cute sticker from the dentist one minute of skin contact to cause swelling. Like me, we can only use a few products on her skin. So when she was a baby, and having skin problems, we switched from All Free and Clear to Seventh Generation Free and Clear. I thought it really worked well, but I got tired of spending $20 a bottle on it. I've been making my own house cleaners for almost ten years now. Every now and then I will buy a Seventh Generation product, but it doesn't happen often. Basically our house is cleaned with baking soda, vinegar and hydrogen peroxide. Our laundry soap was the final hold out. So I started searching Pinterest. I wanted a laundry soap that didn't have Borax in it. I've read conflicting information about it so why chance it? I found a blog called Delightful Creations where she gives some great tips on making your own homemade laundry soap without Borax. Her recipe calls for baking soda, washing soda and castile soap. I've used castile soap in the liquid form to make some of my more elaborate homemade house cleaners, but I've never used the bars before. There are several organic scents to choose from. I always come back to the peppermint though. It smells so clean. I've actually been using this recipe for a little over a month now. I originally made a small batch to test it out. I am beyond thrilled with how this has turned out. We just thought our clothes were getting clean before! Caleigh has some serious stains. G-button, Elecare, Diaper leakage..... you get the point. It's like being a contestant on Wipeout over here. So when I noticed that I was barely having to pre-treat stains I got all kinds of giddy. I do still use Ecover Stain Remover. I've used it for years, I love it and I probably won't stop using it, but now I am needing much less of it. The smell is so fresh. I love the smell of peppermint though so I may be a little biased to the wonderful scent of my laundry room. For years we've used free and clear brands, no softener and no dryer sheets because of our sensitivities. So to have a smell other than wet and sweaty clothes is pretty life changing. The dried and finished laundry is so much cleaner than it used to be. The word crisp keeps coming to mind. I kind of like doing laundry now. I still hate folding and putting it all away, but I enjoy the doing much more now that I made our own soap. I guess it's something about pride in ones work or the fact that I saved our family tons of money by spending thirty minutes making our own detergent. Either way, it's a keeper. I found my soap bars at Whole Foods, on sale for $3.49 each. The large bag of baking soda comes from Costco. It's about $7.00 and there is plenty left over. We buy a bag or two of it each month anyways. The washing soda was about $3 and I needed 3 boxes for this recipe. Also, the only place I could find the washing soda was Wal-Mart. So for around roughly $30 we will have laundry soap for 3-6 months depending on how much we use in each load and how big the loads are. The original post suggests only using 1/8 cup to make it last for a year. I've got my 1/8 cup in the tub, and I usually put two of those in for good measure. Even so if I made a couple of batches of this, that would be a savings of roughly $190 a year. I'm pretty excited about the fresh and crisp potential here. Happy washing! UPDATE: 10/5/15 -- I still make this formula every 3-4 months for our family and I love it! Check out the comments for more ideas and suggestions when making your own laundry detergent for sensitive skin. 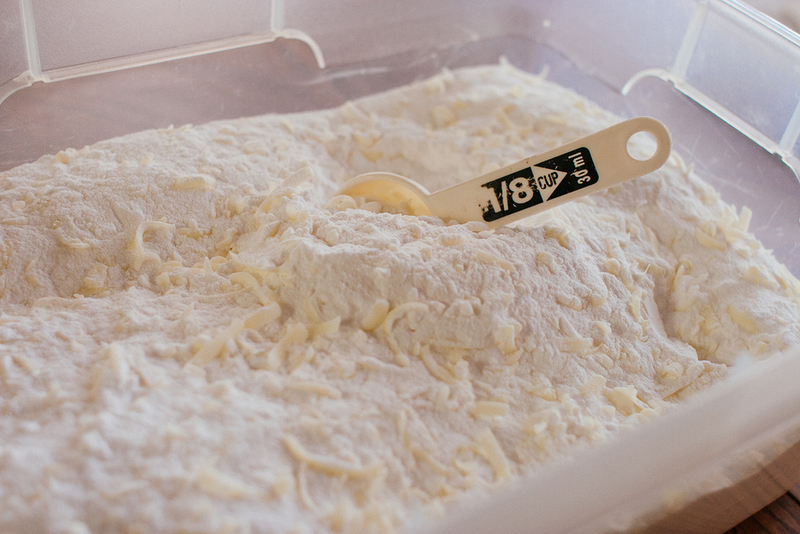 PRO TIP: If you have a food processor, definitely use it for grating the castile soap into teeny tiny crumbs! An ongoing series of waste collections from medically fragile individuals over a 24 hour period. Last Fall I started the One Day Project. I'm asking those of you with medically fragile children or family members to collect the waste from a 24 hour period and send it to me. With this shipment I then curate a photograph and installation. I will send you a print of your One Day and postcards that can be mailed to anyone you chose including your representatives. My goal with this ongoing project is to have hundreds if not thousands of these portraits. Please visit my portfolio for more information on collection and shipping details.